Latching relay - 2 CO contacts - 10 A.
Pluggable on the following sockets : 9244, 9246, 9243 et 9946. 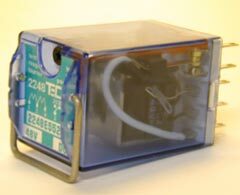 2246 relay is a magnetic latching relay. It can be proposed with the following options : test push-button and mechanical position indicator.